April & May - Springtime in fashion. (C) All images Angela Cliffe. 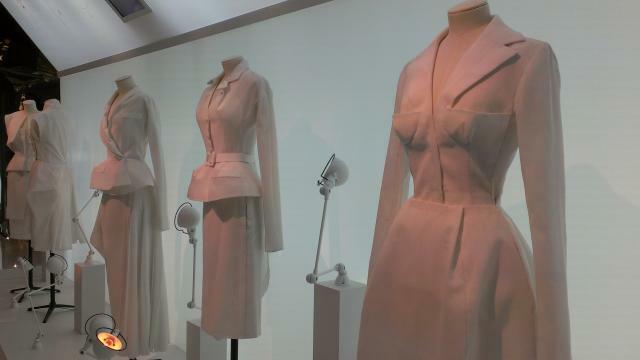 In the merry month of May, the House of Fashion Queens, Dior landed in Harrods and I must say I was loving the generous numbers of Rose Royale coloured pieces in the Dior collections in store. 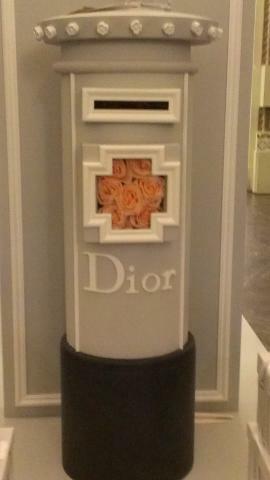 The many faces of the Dior lady where on display around the store and I really enjoyed the extra touches such as the Grey Dior Post Box filled with Roses at it's heart almost symbolising a medicinal cross. One of my reasons for loving the Rose is it's that the ancients believed it to have strong medicinal properties as well as a sweet smell. 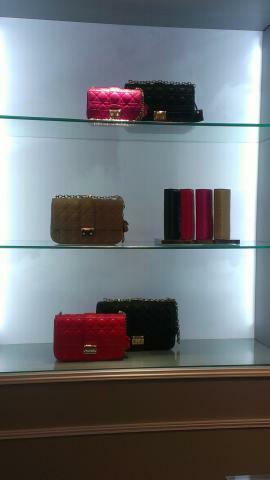 Below as one of my favourite cabinets showing the Rose Royale and Black bags in the Miss Dior line. Black and Pink-Rose colours paired up again in a great contrast. 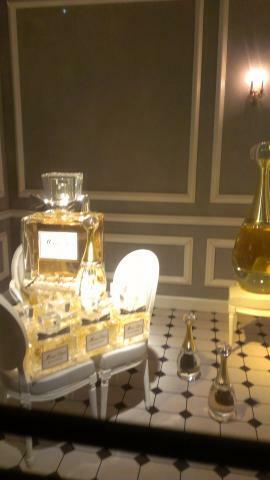 Part of the Exhibition that greets guests is what I think is Dior's answer to Queen Mary's Dolls House at Windsor. 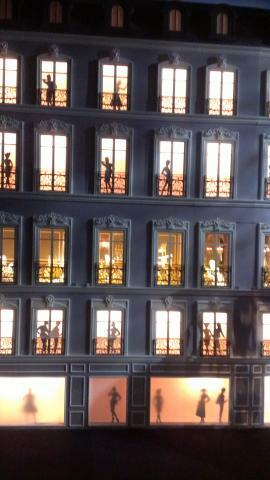 Ingeniously crafted this mini-version of the Maison transported to London is all lit up and ready to show-case Dior's wares. 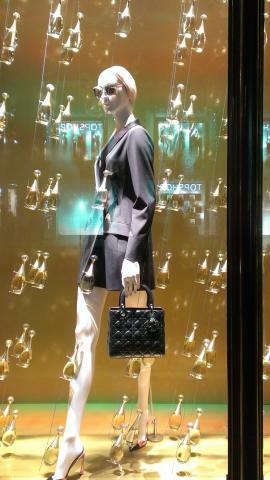 The sillhouetts back-lit in classic Dior poses fill the house. On the middle floor the blinds are drawn right back to show the Ball Room. 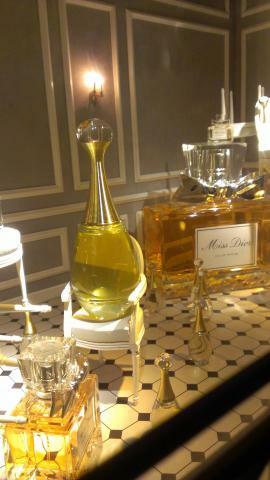 Instead of tiny figures Dior's most famous current scents fill the rooms (clever yes?!) and do the talking. I have a few pictures below as I though this was such a pretty and clever idea. It looks like the bottles have been having some kind of party themselves. I was reminded a little of the Disney animated Film Beauty and the Beast where the objects in the Chateau have a life of their own and take over the Chateau when the Beast is unaware. Anyway - no monsters are hiding here. Only playful Beauty. 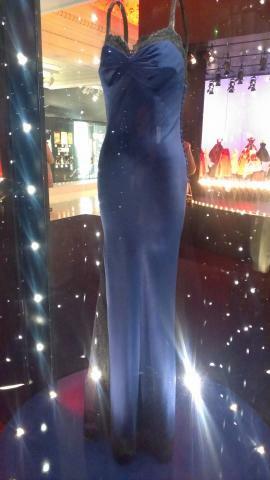 Another Iconic piece from the exhibition was this Midnight Blue outfit designed for Diana, The Princess of Wales. The black lace detail around the decolette and the slash of the skirt length give a touch of daring elegance to the outfit. It's an independant confident piece. Diana's relationship with this House, among the others she patronised, gave rise to the Lady Dior Bag and inspired the Lady Dior fragrance. 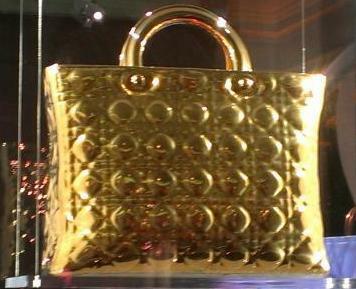 I picked the Golden bag below from the display as in the Lady Dior size it would be the perfect fit for this outfit for a bling-esque evening look. 'Poupees' a funny French word used to describe a handy flexible way that the Fashion Houses used to use to show examples of their collections in the past. In the days before internet and high quality digital mediums of communication this was a great little way to show clothes. Some Houses (Jacques Fath I believe was one) would actually send these collections on tours by themselves to the United States to showcase design to the World. Standing a few inches high but full of intricate detail these dresses, coates and suits were completed in the Atelier to the same high standard as the full sized pieces. These 'dolls' were essential for banking sales of designer pieces in a challenging Post-War climate. 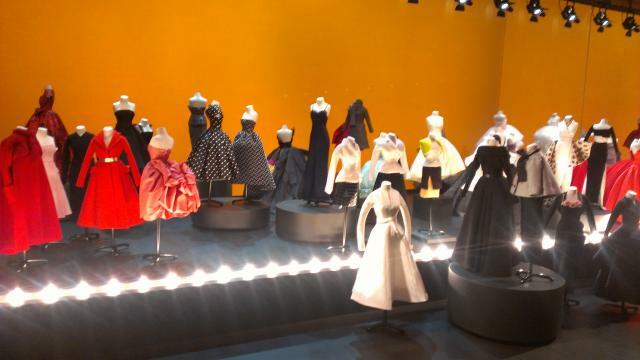 I think it's great that Dior still have them, what a wonderful momento of that era. I bet they are pretty collectable. 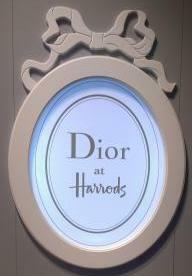 Below are some more fun shots from Harrods' Windows as it was swept away in a tide of adoration for Maison Dior. 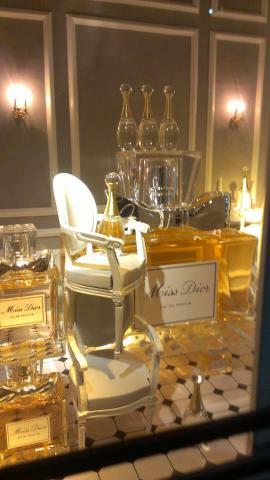 I like the theme of 'Miss Dior' about town. A London Girl look. 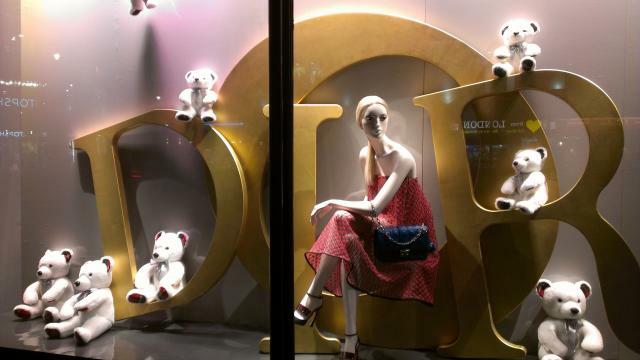 I'm not sure when Dior adopted the Bear but the White and Grey Bear was in evidence across many of the Windows keeping Miss Dior London company on her travels about the Capital. As a country Girl who fell in Love with London I love the use of the Post Box and Phone Boxes and Red London Buses in the Marketing and presentation. it looks snappy and as most of these iconic pieces of British design were here in the New Look Post-War period it really works with the theme of the show. Diamonds are nice but every girl needs her own bear at home to play with now and again. 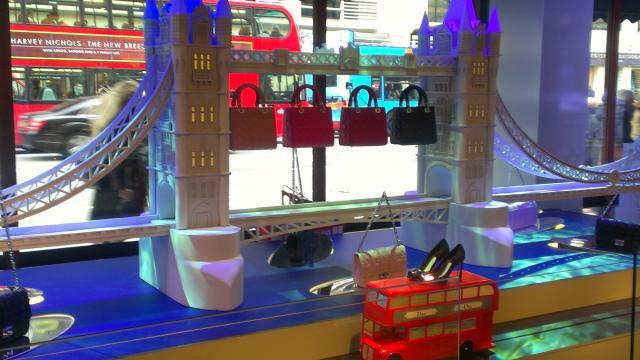 What a great vision - Lady Dior bags hanging underneath Tower Bridge. Pale Blush, through to Magenta and Rose Royale and then Black. Perfect colour scale. Note the Red London Dior Bus in the foreground with some serious shoes above the Top-Deck. Definatley motivational to get you out and busy in the City in the Morning. Below I've added another picture where Lady Dior - about - town looks like she's in a beautiful shower of J'adore Spring Rain. 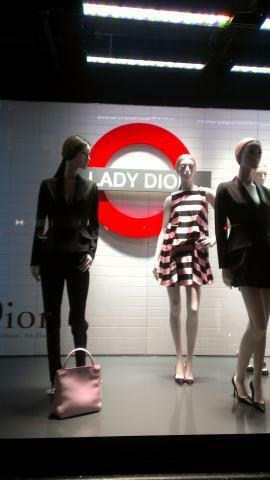 Also I loved the Iconic London tube sign re-worked with Lady Dior branding. Zipping around town these stylish ladies are riding in style in Ready to Wear for Spring and Summer. 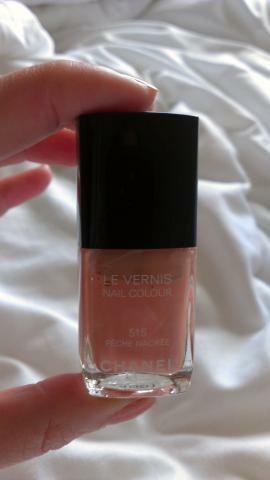 My nail Colour of the moment is a CHANEL favourite Peche Nacre. It's beautiful, light creaminess is great as we head into a warm Summer. It's subtle for professional life and you can blend it with most things for evening wear. 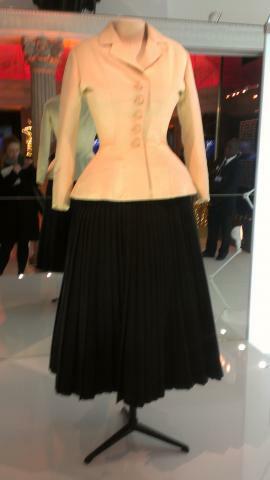 Below to the left is the museum-piece classic Bar outfit from the first New Look collection. It was great to see this in London where the look was so influential post-war. I think some of the ladies passing through this collection would be aqcuainted with the piece first time around. If not themselves directly, then their mothers/aunts or older relatives. You can just about see me in shot next to the Pillar behind at the far left. I think what really strickes me about it is that I'm drawn to thinking about Mr Dior's background in arts, as a gallery owner. Someone who really looked at structure and design pre-dating then his evolution to working in the medium of fashion and textiles. Sitting next to it as a contrast a piece bang-up to date from Raf Simons Spring-Summer 2013 collection. This look, below right, still follows the theme of the top half of the out-fit hugging the body closley and the full flowing skirt below. This outfit was worn by a guest at Princess Madelaine of Sweden's wedding this Summer in Stockholm. One of the most exciting parts about seeing inside a designers Atelier for me is a chance to see the Toiles. Toile is one of those very old Anglo-French words that for me just always has a simple strong resonance. For a long time this has been the tailor and dressmakers material of choice for making the 'draft copy' of an outfit. Looking at the Toile of the piece is a wonderful way to see to the skeleton of it's structure and elements. I love Toiles and find them just as interesting as seeing the finished piece on a client or a model. The Pristine White is really appealling in it's own right. I think it would be intersting for a designers to show a collection through the Toilles, to give an offbeat sence of an outfit deconstructed. 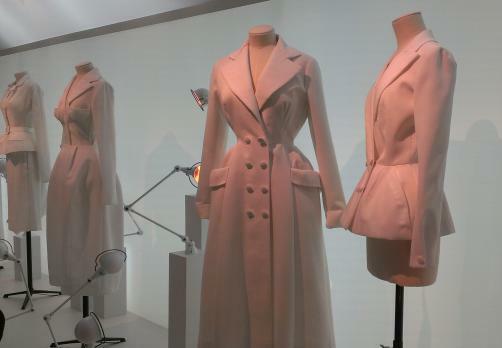 If I could choose a piece from the Toiles below to commission it would be the woman's coat with deep pockets and cinched waist New Look style. It's centered, facing forward in the picture below to the left. 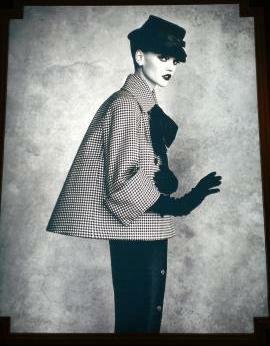 I do have a coat very similar but with a belted waist, rather that buttoned. But I like this model as a more formal alternative.